At first glance, “The Gods Must Be Crazy” is an innocent comedy, full of guiltless slapstick and overtly-prolonged gags. Billed as “an epic comedy of absurd proportions,” it has become a worldwide cult favorite, earning millions, and Rotten Tomatoes ranks it at an impressive 95%. 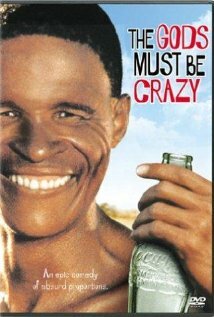 The 1980 film, directed by Jamie Uys, contrasts two distinctly different societies: the “Bushmen” of the Kalahari desert, and the civilian urbanites of post-colonial Africa. It acts as an allegory for the impact of technology on society; both its benefits and its pitfalls. 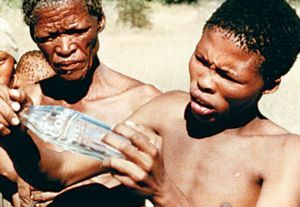 The film begins by presenting the stark differences between the “primitive” culture of the aboriginal Xhosa-speaking Bushmen and the “modern,” technologically-superior culture of the modern world. The Kalahari desert is a foreboding place, the film states, yet the “little people” who call it home live simple lives without law, violence, or turmoil. This quiet, uncomplicated life is juxtaposed against the fast-paced, complicated world of technology by the arrival of none other than an empty Coca-Cola bottle. (The symbolism here is unhidden.) The appearance of the new object, something that Nature Herself could not provide, brings strife to the small tribe, inciting coveting, jealousy, and even conflict to the once peaceful community. Xi, a village leader and the original discoverer of the “evil thing,” begins a long quest to remove the bottle and the troubles it causes from his society. Xi, our lead protagonist, played by Xhosa actor N!xau, is introduced to an eccentric cast of characters, each representing a different cultural standpoint towards technology and its companion modernism. Kate Thompson, the alluring yet finicky journalist (an homage to Farrah Fawcett), is imported from South Africa to work as a teacher on a mission settlement. Andrew Steyn, the clumsy but affable biologist, uses technology to study the elephants of Botswana, or rather, their dung. Sam Boga, the hapless latin revolutionary, is an obvious allusion to Che Guevara and an overt demonization of communism. Finally, Jack Hind, the suave and swarthy capitalist, is a master of technology, bouncing his tour bus throughout the savanna with ease, yet is portrayed as the bad guy. From a purely sociological perspective, the film discusses the inherent costs of technological progress, and thus,“modernism.” As Xi interacts with Western modernism, he approaches it without preconceptions of technological meaning. In a society without ample water, what “is” a Coke bottle, if not a musical instrument, pattern maker, or weapon? Through the naivete of Xi, the film outlines the costs of technology plainly. We see rushed travel by faulty automobiles and a ludicrous scene of a jeep that just won’t stay put. We see scientists that get stranded by rivers that could easily be waded across, clothing that gets caught in trees when its wearers’ concept of decency denies the ease of temperature-appropriate dress, and predatory, lascivious males made to look like heroes simply because their -ahem- tools work better. What is the price of all these technologies? Do their benefits outweigh the costs? An important theme underlying the entire film is a strong narrative regarding the inherent cultural value of possession. Xi’s tribe lives in the Kalahari desert, an area with scant resources. However, rather than pitying themselves and decrying their apparent lack of advantages, his people cherish everything that the gods made for them. Nothing could be either “good” or “bad” to Xi’s isolated community, for all things simply “are” as they are supposed to be. His people would not wish to acquire advantages over the other members of the community because all members are held in the same egalitarian regard. In fact, when the Coca-Cola bottle, an item that could not be shared equally, arrived in the simple society, it caused turmoil, bringing the trials of the modern world to the humble society. Xi’s people had never known greed, anger, or aggression. Those are sins of a world that allows its members to “own” things. A society that allows– even encourages– possession is never satisfied with the things it owns because the value of ownership is not in having things, it is in acquiring them– in acquiring an advantage over others. The cultural value of possession has but one name: Power. In 1998, Neil Postman offered an admonition to all of those who might bow to the god of technology. He suggested “Five Things We Need To Know About Technological Change,” but his most important warning is his admonishment of the unequal distribution of technology. Throughout the film, whether for good or for ill, there are concentrations of material technological resources. Some characters find themselves in conspicuous positions of authority over others because of their mastery of material technologies. Despite this, we find no acknowledgment of technology’s negative impact on society from the characters. No one seems to notice what Xi does. Because a culture that values possession also values methods that increase the likelihood of acquiring more possessions, technologies are naturally concentrated into narrower and narrower communities of people. Both Jack Hind and Sam Boga use their material resources to express their power upon others, inflicting both shame and violence. This, of course, brings us to a different, but extremely important way to view the film. From an historical perspective, The Gods Must Be Crazy is an unvarnished bag of cats. 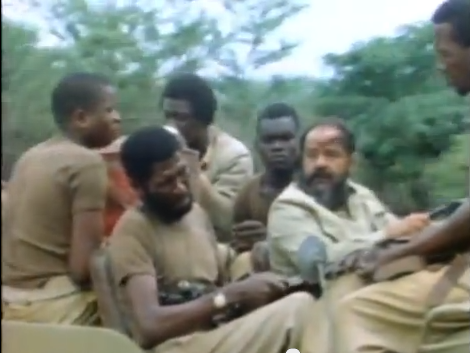 The film was written and directed by South African Jamie Uys in 1980, during the worst decade of apartheid. It is easy to judge the actions of the past through the lens of the present, but we won’t go down that road. Rather, when viewed from the comfort of the present, through thirty years of perspective, the film offers an interesting alternative take to its intended message. As such, it is a poignant snapshot of a troubled moment in world history during the troubles of post-colonial African nationalism, the collapse of Western Industry, and the height of the Cold War. First and foremost, the white South African culture of 1980 can be described as patronizing at best (perhaps even genocidal for lack of a better hyperbole). From the first moment of the film, the narrative is rife with racially and ethnically derogatory paternalism. The uncivilized “bushmen” are actually the Xhosa-speaking Saan people, pushed ever-further north by European colonial incursion. The Saan people who are depicted in the film had to shed any modern clothing or amenities they owned in order to look more “native,” and the incessant clicks and pops that are dubbed over the Xhosa dialogue are shameful. Yes, there are sounds in the Xhosa tongue that do not occur in English, but dubbing extra ones on top of the dialogue is an irritating ploy to make the language sound more exotic. Only antagonizing the film’s salient patronization of black people, even though the story evolves through the protagonism of a native African “bushman,” it is still an ethnocentric “white man’s story,” viewed from only one angle. In the end, it is love story between two white people, and black African people have no real voice in its development. Even the narrator is Caucasian. Everywhere throughout the film, the white man is regarded as the bringer of civilization to Africa. They are the “gods” who drop Coke bottles from on high. The white man wields technology, and thus culture, and is consistently in a position of authority. The only positive aspects of native African culture are its “backwardness” and “innocence,” like Adam and Eve in the Garden. Is this surprising when one realizes that violent apartheid segregation would not end in South Africa for another decade after the film’s release? Apart from the obvious patronization of the black people, the film is painfully gendered. Kate, though merely a journalist, is chosen to teach at a mission school. What are her qualifications? Is this simply because she’s a woman who can read and write? Of course, to travel to the desert of Botswana, she packs only dresses and high heels. She is ashamed of exposing her body, even despite being painfully caught in a Watuba tree, and ultimately falls for the nutty professor, because– well– he’s available, I suppose. The film could also be analyzed for its interpretation of Communism. Boca, the character obviously based on Che Guevara (who participated in the Congolese resistance to Western neo-colonialism) is the villain of the story. Interestingly, while the ideals of Communism support the overarching message of the film, it was released during the height of the Cold War, in which South Africa was embroiled by its apartheid policies. Though Communists such as Che Guevara would agree with Xi’s call for shared wealth and egalitarian community, both it and the brutal subjugation of apartheid are conveniently skipped over in the film. The film does have redeeming qualities. Though I have denounced the ethnocentrism and inherent racism underlying the entire story, it serves to outline the cultural complexities of South African apartheid. Though technology and its natural inclination to encourage the acquisition of greater concentrations of capital are criticized in the film, it is interesting to note that apartheid was overcome in large part by a global consciousness, activated by the technology of the modern mass media. The film also serves as a continued warning at the advance of technological progress. Technology still acts as a vehicle of possession and of power. From a materialist viewpoint, something as simple as a Coke bottle might bring down a civilization. 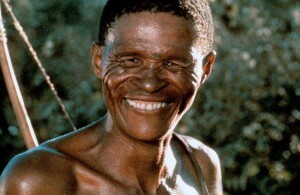 In the end, perhaps it is Xi and his Xhosa speaking “bushmen” who are the more civilized. They had need neither of Coca-Cola bottles, nor of movies to show them of their absurdity. One of the funniest movies ever! I hope you’ve taken the time to watch the other ones too. They’re pretty great too! for me it shames the ‘whiteman’ and the post colonial civilization, in the sense we have lost our connection with nature, it mocks how lost we are in it. This is true for all South Africans now, we have greed and selfishness, it shows among-st all ethnic groups and even with our leaders. This movie should be used educate us on our far we’ve come but at the expensive of our connection to this earth. I dont see it as been racial but learning lesson for all South Africans and infact the world, of how beautiful the true locals of country lived before being disturbed. 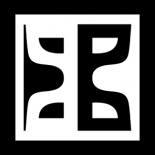 This entry was posted on April 4, 2014 by grahamtbaden in Alas Avatar and tagged african history, analysis, Apartheid, Film Analysis, film history, Jamie Uys, South Africa, The Gods Must Be Crazy, xhosa.